The Japanese Chin is energetic and requires physical activity. Because of its small size, these exercise requirements can be met with a walk or a play session. The Japanese Chin does not do well in an outdoor environment or in weather that is hot. This breed The Japanese Chin is a great companion that enjoys being on the lap of its owner. As much as it enjoys this, it is also an active breed that enjoys an energetic play session. The Japanese Chin has a tendency to want to be wherever its owner is. This breed is friendly with people and animals that it does not know. It is mild mannered and does well around children. The Japanese Chin has been compared to a cat in the past due to its catlike personality traits. The Japanese Chin is energetic and requires physical activity. Because of its small size, these exercise requirements can be met with a walk or a play session. The Japanese Chin does not do well in an outdoor environment or in weather that is hot. This breed may have a tendency to wheeze, especially in humid conditions. 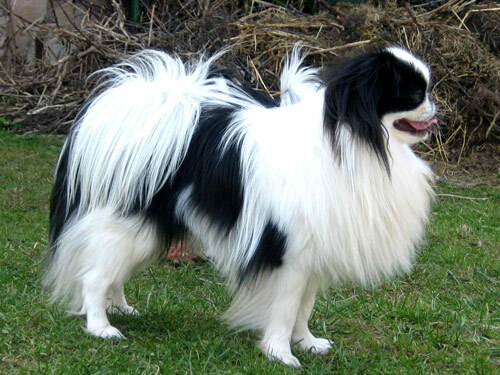 The coat of the Japanese Chin requires minimal maintenance with combing necessary two times each week. The minor health concerns for the Japanese Chin include patellar luxation, KCS, entropion, cataracts, and a heart murmur. Occasionally seen in this breed is achondroplasia, epilepsy, and portacaval shunt. Regular testing of the knees and eyes is suggested. The average life span of a healthy Japanese Chin is ten to twelve years. This breed can also develop corneal abrasions. Unlike the name of the Japanese Chin, the breed actually originated in China. The Japanese Chin has a similar history to the Pekingese as it was often given as a gift to the nobility. There are different theories about how the Japanese Chin first made its way to Japan. One thought is that it was brought to Japan by Zen Buddhist teachers around A.D. 520. Another belief is that a Korean prince arrived in Japan with several of these dogs in A.D. 732. A last theory is that the breed may have been given as a gift to a Japanese emperor by a Chinese emperor more than a thousand years ago. Despite its method of arrival, this breed was fancied by the Japanese Imperial family. It was originally thought of as a lapdog or a decoration, with some of the dogs being so small that they were kept in bird cages. The Japanese Chin eventually made its way to Europe by way of Portuguese sailors that were trading with Japan during the sixteenth century. In 1853 the first Japanese Chin officially arrived in Europe as Commodore Perry offered a pair of these dogs from Japan to Queen Victoria. The Japanese Chin continued to increase its presence in Europe and America as traders brought these dogs over. The breed was initially recognized by the name Japanese Spaniel during the late 1800s by the AKC. The Japanese Spaniel dogs were bigger in size then the Japanese Chin of today and there is a theory that the smaller size came when the dogs were crossed with the English Toy Spaniel. The trading and import of the Japanese Chin was reduced after World War I but the breed remained popular. Today the breed has a modest presence in America while it is still greatly favored in Japan.